The ‘xtal’ in XtalDave is shorthand for “crystal” – this is because my major specialisation in the field of biology is protein x-ray crystallography. Crystallography is a technique with allows us to plot the location of atoms within proteins, DNA and other biological molecules with a high degree of accuracy – generally to within 0.1 of a nanometre (1/10000000000th of a metre). This accuracy makes crystallography one of the single most powerful techniques (second perhaps only to genetics) for exploring the mechanisms of how life works. In my opinion, the complex loops and whorls of protein structures make them inherently beautiful, and this is one of the reasons I always look forward to the next structure I examine or solve. Below are some representations of some of the structures I have solved. Links to publications (where applicable) are included. 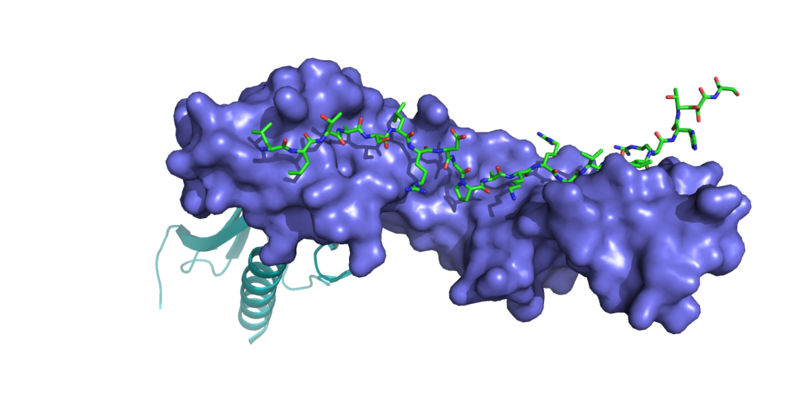 This toxin is responsible for ~30% of bacteria food poisoning cases – it is a pore-forming toxin that punches holes in the cells that line your small intestine. Symptoms can develop as rapidly as 60mins after ingestion of the tainted food. 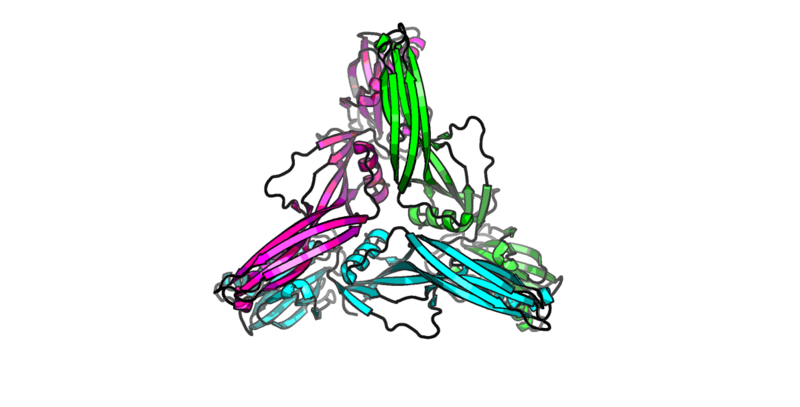 In the structure, the protein is composed of three chemically identical protein chains, forming an intimate trimer. Each chain is represented in a different colour. I did this work whilst I worked at cancer research UK. The TES gene is being investigated as it is frequently damaged during various types of cancer, and when the gene is absent in mice, these mice are more likely to develop cancer than those that have a functioning copy of the TES gene. In normal cells, TES functions to regulate certain aspects of cell motility (cell crawling), and it serves as an adaptor/regulator protein that binds to and alters the activity of other proteins involved in cell motility. Phosphatases are important regulators of all sorts of cellular functions, from cell division to cell motility and environment sensing. SDP-1 is a yeast phosphatase that due to its function, needs to be active when cells are experiencing oxidative stress. Paradoxically, this class of phosphatases are generally inactive when oxidised. We wanted to know how SDP-1 was active when it shouldn’t have been. This turned out to be such an interesting story it was published in Nature. Yay! TSG-6 is a odd little protein. It’s a small (35kDa, so the same mass as 35000 hydrogen atoms) human protein that gets secreted into the extracellular matrix (i.e. the stuff outside cells). The extracellular matrix is a strange place – many of the proteins that exist out there fulfil structural roles – like collagen in tendons and aggrecan in cartilage – the ECM is also an incredibly important place. When cells communicate with each other, a lot of this communication occurs via the extracellular matrix. 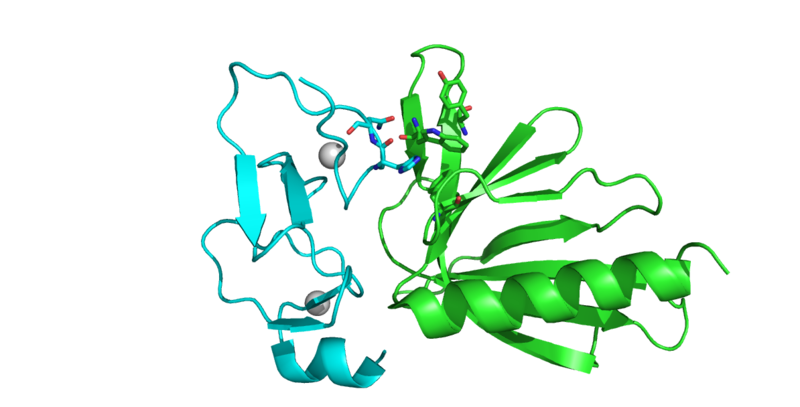 TSG-6 has two domains, a LINK domain, responsible for binding to the glycosaminoglycan Hyaluronan (yes, the same stuff you get in faddy cosmetics), and a CUB domain, function unknown. One of the important roles of TSG-6 is in the formation of the matrix around oocytes (eggs) in fallopian mammals. No TSG-6, no oocyte matrix, no fertilisation. 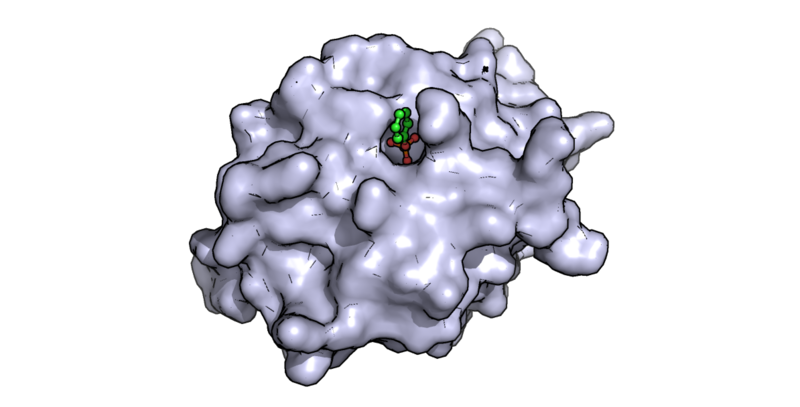 One of the things that TSG-6 does which makes it unique is to covalently attach a class of proteins (snappily titled Inter-alpha-inhibitor heavy chains) onto Hyaluronan. We knew that this activity of TSG-6 required the CUB domain, and we knew that this activity requires metal ions to be present. In this study we show that one of the metal ions is calcium, and we show where the calcium binds (in the CUB domain). We also showed that one particular amino acid in the protein is important in the activity. We went on to show that it is this particular activity of TSG-6 (the covalent transfer of the heavy chains) that is required for correct oocyte matrix formation, and therefore why TSG-6 is necessary for fertility. At the time – we thought that SSL7 (a protein toxin produced by Staphylococcus aureus) was a superantigen, that was responsible for toxin-shock syndrome type pathologies. However, subsequent work suggests that whilst these proteins are structurally similar to superantigens, they are in fact responsible for inhibiting the innate imune system, helping the bacteria evade destruction whilst they invade mammalian hosts. Cool, huh? This protein is one of the main causative agents in gas gangrene – it destroys eukaryotic cells by digesting their cell membranes. This releases the nutrients from within the cell, allowing the bacteria to utilise them to grow and reproduce. This is also (probably) an example of horizontal gene transfer. 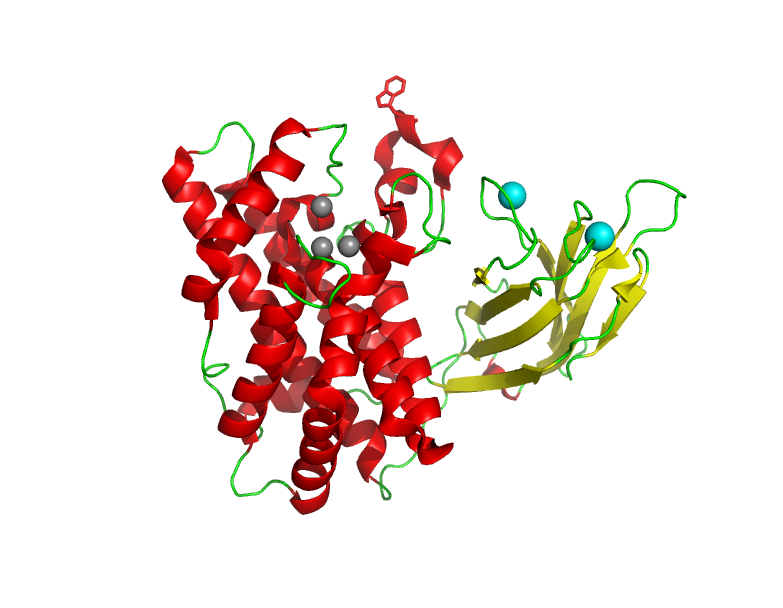 The red, alpha helical domain is a phospholipase C domain, found in many bacteria as a non-toxic enzyme used to breakdown fatty acids. 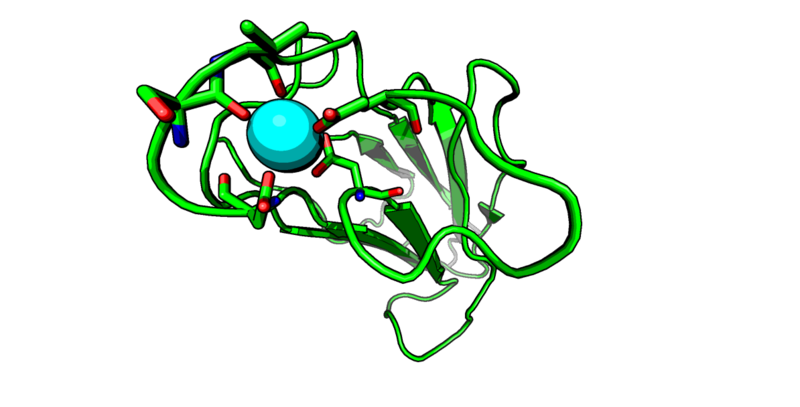 The yellow ‘C2’ domain is (other than in this family of proteins) only found in eukaryotes and is a membrane binding domain. Mix the two together and you have a highly potent enzyme capable of binding to and degrading eurkaryotic cell membranes. Absolutely beautiful way to highlight your important research achievements. I’m always amazed given how many theoretical ways to ‘fold’ protein chains at how they take these complex convoluted forms! how do they “know” or is there only one option really? The driving force for protein folding is thermodynamics – so they will always tend towards the lowest energy conformation. 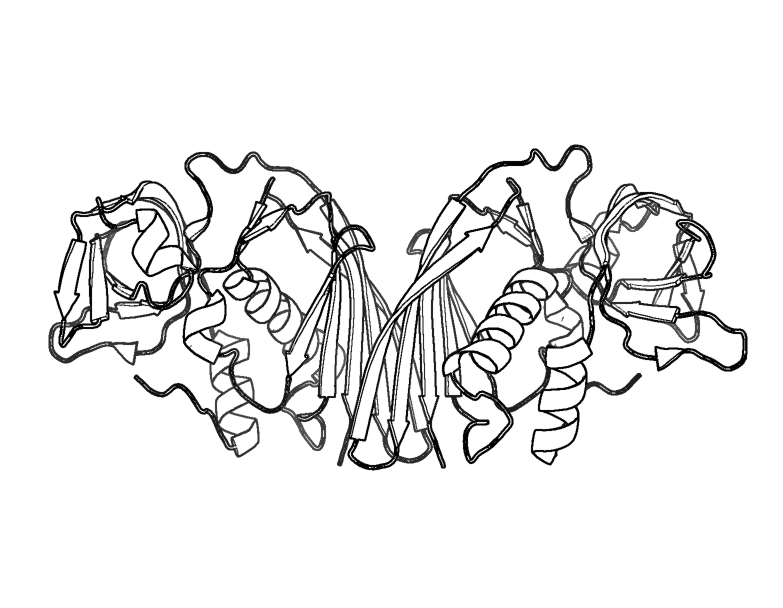 However – proteins are not the static structures we see in protein crystallography – there is dynamism (flexible loop regions, hinges between domains etc) and some protein “breathing” – gentle flexing of the protein domains which is suggested by techniques such as NMR.